Whenever name of any important religious place comes, Pushkar holds the prime importance. It is sacred town of Hindu religion believers located around 15 kms from Ajmer. The place is famous for its Brahma Temple which is one of its kinds in the world. 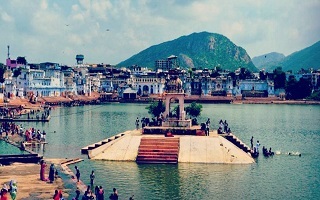 Pushkar lake in the centre of town is not less than a miracle. Having numerous bathing ghats and temples around, Pushkar lake holds a great religious values among the pilgrims. Darshan of Lord Bhrahma at temple and a holy dip in the water of Pushkar lake ensures the salvation. Along with temple and lake, Pushkar camel Fair is the other great and gala event that has been the identification mark of this distinct small town among the people of globe. Every year the town becomes alive with new vibrant energy in the month of October-November on the weeklong Pushkar fair. Thousand of camels, cows, goats, sheeps and their traders come to Pushkar fair. Along with trading lots of engaging activities like camel races, horse dance, matka race, bridal competition and rope pulling etc are centre of fairs attraction. Either a short weekend program or during you Rajasthan tour, Pushkar is must visit place. A short drive from Jaipur via Ajmer will take you to holy town of Pushkar. On arrival check into the hotel. After freshen up proceeds to explore the beautiful and unique holy town of Pushkar. Brahma temple a few from the prominent temple dedicated to Lord Brahma in India and is the prime shrine of the diety. The temple is situated close to Pushkar Lake. The temple is said to be 2000 years old. Every year on Kartik Poornima a festival dedicated to lord Brahma is held, during the festival thousands of pilgrims visit the temple and take bath in holy water of Pushkar Lake. Savitri Temple, Ranga Ji Temple, Varah Temple are among the other famous and religiously important temples of Pushkar. After the temple visits you can explore the local market of Pushkar and can enjoy camel ride. Pushkar is a small town with huge religious sentiments attached to it. It is believed that the Pilgrimage to Chota Char dham is incomplete without taking a dip and bath in the holy water of Pushkar Lake. Darshn of Lord brahma in the main shrine sets a person free from sins. Pilgrims from all around the nation visit the place, the charm of this small town reach upto its real height during the Pushkar Fair in October-November. During this period the small town becomes huge. There are good hotel options of stay available here. Nearest railway station is of Ajmer. The town is well connected by road from Ajmer and Jaipur. Nearest airport is of Jaipur from where there are regular flight to different cities of country. Hence if you have short time and want to explore really something different and unique then must plan for Pushkar.